Hell is a specific destination within the Christian and Islamic religious mythology for sinners and/or and more specifically those that fail to atone for those sins. Other religions have analogous destinations, of varying qualities and distinctions. Basically hell is a way religious leaders control their followers along the lines of, "Do as we say god or the gods and godesses want or you will be punished in hell after you die." For the majority of Christians, Hell is a place where people go when they die or are destroyed by Jesus's Second Coming. For the Islamic faith failure to truly follow the word of God will result in going to hell. The majority of Christians believe that God sends good people to heaven by proxy of accepting Jesus as our saviour (For some, being "good" is irrelevant, Faith alone is needed). People that fail to accept Jesus as saviour meanwhile are condemned to hell for eternity. The Islamic faith more specifically refers to those unbelievers, or unfaithful being cast into a graphically specific torturous and perpetual suffering. Various interpretations exist as to what constitutes hell-worthy behavior, how long an individual stays in hell, whether hell is a distinct place apart from the earth or the earth itself undergoing destruction as described in The Book of Revelation. Other mythologies have specific destinations that may or may not share specific qualities with the Hell defined by the Christian / Islamic faith. Priests invented hell to frighten people into obedience. This conclusion is based on there being no reliable evidence that Hell exists but priests pretend that it does. This is probably motivated by the desire for personal power or the honest wish to coerce people to towards God. "Religion is always in the control business, and that’s something people don’t really understand. It’s in a guilt-producing control business. And if you have Heaven as a place where you’re rewarded for you goodness, and Hell is a place where you’re punished for your evil, then you sort of have control of the population. And so they create this fiery place which has quite literally scared the Hell out of a lot of people, throughout Christian history. And it’s part of a control tactic." "The most general formula on which every religion and morality is founded is: 'Do this and that, refrain from this and that — and then you will be happy! And if you don't...' Every morality, every religion, is based on this imperative; I call it the original sin of reason, the immortal unreason." Several historical religions confined to antiquity had their own specific destinations for those viewed as unworthy to progress to the subsequent level of existence as defined by their faith. The majority, particularly those pre-dating the Abrahamic religions, confer their destinations with mixed descriptions and environment. Egyptian theology referred to a great "devourer" whereby all semblance of self was annihilated and eternal life deprived from the recipient. The description of eternal salvation offered by Osiris the Lord of the Dead (or "living" as per Egyptian myth of afterlife) and Rebirth. These qualities were to inform the Israelites sensibilities during their internment in the land of Egypt under the Pharaohs. The Books of the Netherworld (inscribed on the walls of Royal tombs) describe a hell that would marry up more closely to that of Middle Age descriptions of a physical underworld filled with torment and torture with the eventual aim of complete annihilation of those that were judged unfavorably by the "weighing of their hearts". 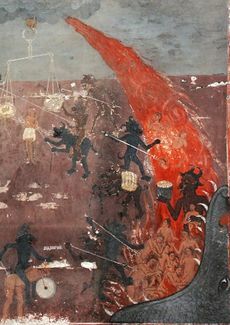 Egyptian hell also features the mention of a "Lake of Fire" a popular visual image to be re-imagined after the establishment of early Christian texts of the Coptics. Particularly in the Egyptian faith (but also a feature of other religions) is the process of the blessed also being required to pass through this netherworld before reaching their eventual destination, the "field of rushes". This test, with guardians and denizens of the underworld fuelled a rich mythology that influenced the Abrahamic religions heavily. Prior to the Exile (to Egypt), the Hebrews had no concept of Hell. There was a concept of Sheol, which is translated variously in the Hebrew Scriptures as "abyss", "hiding place", "grave", and "pit". In some translations (KJ-IV) sheol is replaced by "hell", although this makes no sense when it is clear from each context that it is not a place of eternal torment. Jacob would hardly say "No, ...in mourning will I go down to [an endless hell] to my son." Nor is it probable that Job would pray to God to "hide him in a place of endless torment," in order to be delivered from his troubles. The only clear thing about Sheol is that this was a well-known concept amongst the ancient Israelites. It was not until the Pharisees (c. 100 BCE) that the notion of a spiritual life after death developed in any meaningful way in Jewish thought. The Pharisees, who were the forerunners of the rabbis, taught that when the Torah spoke of reward for following God's ways, the reward would be forthcoming in an afterlife, Olam Ha-Ba (world to come), as they called it. At the same time as the Egyptians, the Mesopotamian Polytheistic Babylonian and Sumerian Empire had developed its own concepts of the afterlife, the Underworld or Netherworld known as Arallu. No punishments are described, only a description of a bleak and dreary abode ruled over by Ereshkigal and Nergal. The Dumuzi-Ishtar Dumuzi-Ninanna myth concept of lent and resurrection (qualities subsequently lent to Osiris and Adonis) was to rear itself in the prophecies featured in the Old Testament that Jesus is asserted to fulfil. Greek mythology defines the underworld with various terms. Hades is the all encapsulating concept of the underworld, within which is Tartarus - the hellish component. Hades in this case more closely mirrors the Judaic Sheol (and Old Testament translations often render Sheol as Hades) or the Mesopotamian Arallu as a dark, gloomy abyss or pit. Tartarus meanwhile, as defined by Plato, is the place where souls were punished after death. Plato posited in Gorgias that judgement was delivered upon death. This usage of Tartarus was to later inform Catholic liturgy, and form a basis for interpreting the original context of Judaic scripture. The Aztecs believed in a neutral after life of Mictlan, however access to the land featured trials and tribulations. Gehenna (alternatively Gehinnom, or the Valley of Hinnom) described in various locations in the vicinity of Jerusalem is commonly translated as "Hell" (rightly or wrongly) within the context of the new testament (alternatively Tartarus, Hades and Sheol were used interchangeably when referring to synonymous post-death states). The valley (or ravine) has a long history as a site of burning apostates, corpses and as a valley of the damned giving a a literal and metaphorical relevance to those that would later hear Jesus speak of Gehenna in his sermons. Human sacrifice to the Ammonite God Moloch is recorded until 6BCE. Joshua 15:8 "the ravine of the son of Hinnom"
Nehemiah 11:30 "And they dwelt from Beersheba unto the valley of Hinnom"
Chronicles 28:3 "Moreover he burnt incense in the valley of the son of Hinnom, and burnt his children in the fire, after the abominations of the heathen whom the LORD had cast out before the children of Israel." Matthew 5:22 "But I say unto you, That whosoever is angry with his brother without a cause shall be in danger of the judgment: and whosoever shall say to his brother, Raca, shall be in danger of the council: but whosoever shall say, Thou fool, shall be in danger of hell (Gehenna) fire." The explanation for rendering Gehenna as Hell is weakened further still when considering the changing meaning of hell, both etymologically and in Catholic liturgy. Luke 16:24 : "And he cried and said, Father Abraham, have mercy on me, and send Lazarus, that he may dip the tip of his finger in water, and cool my tongue; for I am tormented in this flame." Matthew 13:42 : "And shall cast them into a furnace of fire: there shall be wailing and gnashing of teeth." Matthew 25:41 : "Then shall he say also unto them on the left hand, Depart from me, ye cursed, into everlasting fire, prepared for the devil and his angels:"
Revelation 20:15 : "And whosoever was not found written in the book of life was cast into the lake of fire." This view was also popularized in Dante's Inferno, in which Dante envisioned a multi-leveled hell where different crimes were punished by customized tortures. C.S. Lewis favored a softer view of hell in The Great Divorce. Lewis's hell is portrayed as an endless, desolate twilight city upon which night is imperceptibly sinking. The night is actually the Apocalypse, and it heralds the arrival of the demons after their judgement. Before the night comes, anyone can escape hell if they leave behind their former selves and accept heaven's offer, and a journey to heaven reveals that hell is infinitely small; it is nothing more or less than what happens to a soul that turns away from God and into itself. Some Protestants believe that every sin however small deserves Hell and they live in perpetual fear that they will end up in Hell over some minor sins while their church controls them through this fear. Other Protestants believe that once they've accepted Jesus they're saved and seem to believe that they're assured of Heaven but they have to live good lives as well. It gets confusing and it's not clear what they think happens over sins committed after they're saved, after all nobody can stop sinning. Roman Catholics believe those guilty of small sins, called venial sins and those needing purification for mortal sins that have been forgiven spend time in Purgatory before entering heaven. It is odd to a secular way of thinking that any finite crime would warrant infinite punishment. Any human who proposed to torture other people eternally would be considered cruel and monstrous. Some theists claim that there are no finite crimes relative to God; everything humanity does is infinitely worse than what God would do, so every crime is worthy of infinite punishment. But this means that morality is based on a relative standard rather than absolute scale, and it would mean that even supposedly "good" acts which humans perform (such as praying) would also be infinitely evil. God was unable to create or develop other systems of punishment/reward that were less harmful to human life and the high value he himself attached to it. God was bound to a higher standard of morality if he was unable to forgive sin without the blood sacrifice of animals or other divine beings. God cannot be omnipotent and "wish that none would perish" while declaring that some will perish. God is a liar if he says he wishes all to be saved yet devises an intricate sorting system that is the cause of those who will perish. God cannot be Omnibenevolent if he creates people when as an Omniscient being he foreknows that they will end up in Hell.